With a stay at Fairmont Le Manoir Richelieu in La Malbaie, you'll be next to a golf course and 6 minutes by foot from Charlevoix Casino. 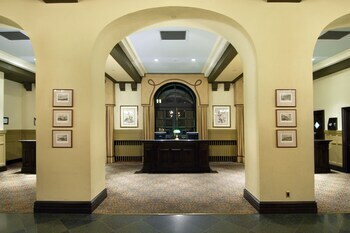 This 4.5-star resort is 1.2 mi (1.9 km) from Charlevoix Museum and 2.1 mi (3.3 km) from Murray Bay Golf Club. Make yourself at home in one of the 405 air-conditioned rooms featuring minibars and flat-screen televisions. Complimentary wired and wireless Internet access keeps you connected, and pay movies provides entertainment. Private bathrooms with shower/tub combinations feature designer toiletries and hair dryers. Conveniences include phones, as well as desks and coffee/tea makers. Relax at the full-service spa, where you can enjoy massages, body treatments, and facials. Gambling sorts can try their luck at the casino, while others may prefer a health club or an outdoor pool. Additional amenities at this resort include complimentary wireless Internet access, concierge services, and babysitting/childcare (surcharge). Enjoy local cuisine at Le Charlevoix, one of the resort's 5 restaurants, or stay in and take advantage of the room service (during limited hours). Snacks are also available at the coffee shop/café. Relax with a refreshing drink at the bar/lounge, the poolside bar, or one of 2 bars/lounges. Full breakfasts are available daily for a fee. Quebec Jean Lesage International Airport (YQB): Approximate driving time is 90 minutes and distance is 100 km (63 miles).